Happy New Year. 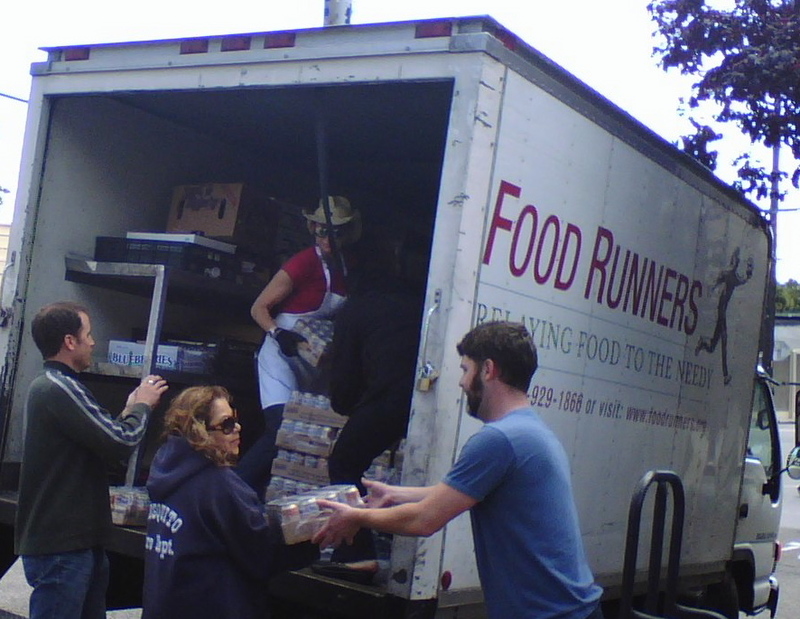 Food Runners marked another busy year serving the greater community. Check out Food Runners top ten highlights from 2010. 10) GOOD THINGS COME IN SMALL PACKAGES. It isn't large; one pan full, but it's one good pan full. In November, Nettie's Crab Shack in Cow Hollow joined the ranks of Food Runners planned overage program meaning that, once a week, Nettie's prepares a nutritious entree, large enough for 20-25 people, specifically for donation to Food Runners. 9) GOOD THINGS COME IN BIG PACKAGES TOO. Zynga Games Network is big and getting bigger all the time. Zynga began donating to Food Runners in June of 2009. Since that time, they have moved to a larger building and have gone from donating 2-3 three times a week to twice a day (morning and afternoon), 5 times a week. The food is and always has been fabulous. And it's always a lot. Food Runners volunteers can't say enough about how much they love delivering Zynga's generous, yummy donations. 8) SCHOOL DAZE. Acre Gourmet's "Real School Lunch Program" further solidified its ongoing partnership with Food Runners by adding regular pick ups from Town School to its already long standing pick ups from sister client, Cathedral School. Inspired by reading about Acre's efforts from Town and Cathedral, Chef Ian Morrison of Convent of the Sacred Heart School called Food Runners to begin a donations program. Donations from schools like Town, Cathedral and Sacred Heart are carefully directed to after school programs serving low-income kids such as Thrive House and Booker T. Washington Community Center. 7) IT'S NOT ROCKET SCIENCE. Genentech Head Chef Yoel Cohen couldn't stand seeing excess food from Genentech's on campus Grab n' Go cafes get thrown away. He knew there had to be a better way. Chef Yoel called Food Runners. It took a little while for Chef Yoel to navigate Genentech's in-house security concerns, but he never gave up. The excess Grab n' Go food doesn't get thrown away anymore. Since last February, Food Runners has been picking up from all the Grab n' Go's on campus on a daily basis. The food includes organic salads, beautiful wraps, sandwiches and more. 6) HOLIDAY MADNESS. Thanksgiving and Christmas were extra special at Food Runners in 2010. On the Tuesday before Thanksgiving, A.G. Ferrari Foods donated 50 complete Thanksgiving Dinners to Food Runners. Food Runners volunteer Lynn B. delivered the dinners to Clara House where they were received with awe and great appreciation before being enjoyed by the women and children residing there. On the Thursday before Christmas, Gastronaut Catering implemented its first "We Wish You a Tasty Christmas" program. 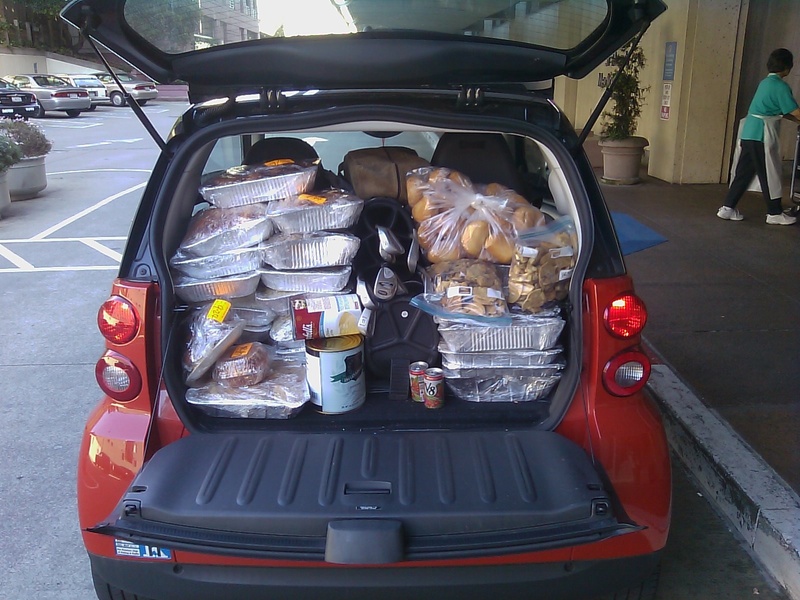 Gastronaut, who donates three times a week to Food Runners on a regular basis, prepared a holiday feast for 40 especially for donation to a family shelter of Food Runners' choosing. The feast went to Jelani House in Bayview, not far from Gastronaut. The meal was picked up and delivered by mentors and their youth mentees from the Building Futures mentor program who volunteered for Food Runners for the purpose of learning about the importance of giving back. 5) SHIPSHAPE. "Your gonna need a bigger vehicle," came the sober response from Travis when asked if the food donation would fit in a car. The big ship docked at Pier 80 had come in to port sooner than planned. Three days worth of food enough for the crew of 60 sat on board. The ship wasn't scheduled to go out again for months. Travis, the vessel's food manager couldn't bare to see all that good food go to waste. He called Food Runners. 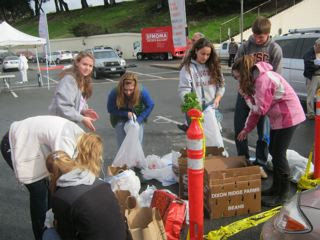 The load filled the Food Runners truck to bursting three times. The folks at Hamilton Family Shelter, the Lucille Withe Center, Next Door and Martin DePorres all ate well that September weekend. 4) AT LAST. In May, Executive Chef Lucas Shoemaker of McCall's Catering and Events came aboard the Good Ship Food Runners. McCall's follows in the footsteps of fellow premier caterers and long time donors Paula Le Duc Catering, Taste Catering, Best Beverage and more. When McCall's calls, it's not just another pick up. It's an occasion. McCall's is organized, efficient, generous and the food is FAN-tastic. 3) FARM FRESH. Food Runners added four farmers markets to its list of regular farmers market pick ups. They markets added in 2010 are: the Upper Haight Market, the Inner Sunset Market, the Mission Community Market and the Fort Mason Farmers market. 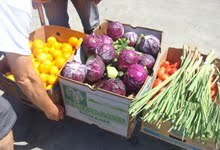 Fresh produce is gold in the food donations arena and Food Runners struck another vein in the Mother Lode. 2) WHERE'S THE BEEF? It's still happening! Food Runners founder Mary Risley saw a need and she filled it. Mary heard that the shelters never had enough protein. Last Spring, Food Runners resumed the meat program meat program Mary instituted in 2009. For the second year in a row, Food Runners purchased $1,000 of meat per week, for 20 weeks intended specifically for donation to the shelters. This year's meat supplier, Del Monte Meat Company has been most generous making sure that a generous amount and variety made up every order. Upon reading about the program in this very space in October, local citizen Kathy K. immediately donated $5,000 for the purpose of extending the meat donations for an additional five weeks. This from Food Runners volunteer David T. about a man on the receiving end of a weekly Saturday food run shared by David, his wife and some Food Runners volunteer friends: "Robert has become, for us, the human face of the people we touch in our role as middle person between the food and those who need it. But he has become more than a client. He has become a friend and a man with a back story that, like some gigantic onion, gets peeled back layer by layer each time we interact with him. We will be making two runs on Chirstmas Eve of the usual overflow from Trader Joe's. We are hoping against hope that, despite the non-Saturdayness of the runs, we will be able to find Robert there on the curb outside his building where, if we are lucky, he will make our Christmas, not vice versa." It's a brand new year! Remember to spread the word that Food Runners is always looking for more food. Tell your local restaurants, grocery stores, bakeries and other businesses that they never have to throw away or compost good, edible food. Food Runners is just a phone call away at 415-929-866. And don't forget to tell your friends that they can help too by becoming a Food Runners volunteer or by making a monetary donation to Food Runners. Giving back never felt so good!